January 20, 2015 by Dreamz Unlimited! Vibhu Virender Puri, an FTII graduate has come up with this unique untold and hence unknown story about Shivkar Bapuji Talpade, a man who is said to be the actual inventor of world’s first plane much before the invention done by Wright Brothers who are officially called the inventors of Plane. It is the debut film of Vibhu as director, writer and lyricist. Music has been given by a debutante Mangesh Dhakde, Rochak Kohli, Ayushmann Khurrana and Vishal Bhardwaj. The carelessly flowing composition is actually the highlight of the title track which is Rochak Kohli’s first song as singer with the voice that sounds like an appropriate mixture of the voice of Mohit Chauhan and Ayushmann. Rochak has set the arrangements very alive with whistle and backing vocals ornamenting the track and Guitar being the leader, successfully impresses the listeners. The drawback is just that it grows on you after listening multiple times and not gets carried with you in the first attempt. Give it few chances to be liked by you. Rochak gets much amazingly better in his next track which has a lovely tune and the playfully played keherwa rhythm beautifies it even more. But what stands out is the lyrics by Vibhu Puri. If you clearly know what the film is about, you’ll flatter the way the lyrics has been written. Each line tells you Mr. Talpade’s passion for inventing the Plane. The lyrics seem to be depicting that the song happens after the invention of Plane or just before the completion. Mohit Chauhan is outstanding and so is the Flute that appears everytime in the line Daak ticket jaari hogi. An adorable creation! The song kicks off with splendidly played Accordion that itself indicates that you are going to find something special. Mohit superbly delivers yet another applauding performance and Neeti gets the most melodious portion of the song which makes you remember the black & white 50s songs. Vibhu here too is fabulous with the writing. Mangesh has used the Goanese flavor which is very intriguing. Fascinatingly good. Generally, Ayushmann’s songs are recognized by the typical way of playing Guitar, but here he has quite intelligently composed Ghalib’s popular poem which is already used many times before with completely different notes, in a poppy way and fused it with Ghazalion texture using Sitar and Santoor in the first and second interlude respectively with Tabla being the consistent supporter. The reprise version is even more poppy where he has replaced the instruments with beats which is also very appealing. Shweta’s brief rendition of aankh ka dariya in the Reprise just makes it more lovable. She sounds very similar to Shilpa Rao, that’s what I noticed. A youth/mass appealing approach of Ghalib. Apart from proving to be meaningful for the film, it also has nice inspirational lines which fit into every aspect of our life. The Hans has been metaphorically presented as the Plane which he had invented as well as Mr. Talpade himself or his dream. The orchestration is good and has given a devotional approach to the song. Sukhvinder, as always, is fabulous with partner Ranadeep. Mangesh scores in this too! Vishal Bhardwaj has come up with the most rocking track of the album. A lavani number rendered by who better than his wife Rekha Bhardwaj with her typical salty vocals. What I liked most about the song is the beats which Vishal has put in the hook line. Amazing beats which are so well mixed that everytime they come, you get a smile on your face. Antara is impressive and so is the chorus. A Killlller by Vishal Bhardwaj! Don’t excite yourself much by seeing Harshdeep’s name as it’s just another much shorter version of Udd Jayega which is handled enchantingly by Harshdeep. Mangesh has kept Violin orchestra in background with constant humming sound that is sounding relishing to ears but we wish it would be a little longer. Short but damn soothing! Rochak Kohli has actually showed his creativity now with this album. He goes creatively amazing in this track as well with Papon leading it. It’s far from what we listen regularly in Bollywood yet it goes well with ears having Banjo creating the atmosphere of uniqueness and happiness. Ayushmann and Monali each have got just a line to sing which doesn’t have much relevance though changes the mood delightfully for a very short period of time. Lyrics are again clearly depicting what would be happening in the film. A well-attempted creativity. Another variant of Udd Jayega which has a Sufi approach, Wadali Brothers aptly being on board, has made the Sufi atmosphere stronger. With Harmoniums, Tabla and the utterly well-managed chorus and arrangements, the song sounds more beautiful. Vibhu has changed the lyrics for good and the ensemble voices are creating a strong impact which is again for good. The Sufi variant of Udd Jayega, better in some aspects. You hardly get to hear so much of creativity with melody in a single album! Rochak Kohli, Mangesh Dhakde, Ayushmann Khurrana, Vishal Bhardwaj and Vibhu Virender Puri along with the blessings of Mirza Ghalib, deliver one of the best albums of 2015! February 22, 2014 by Dreamz Unlimited! When I say Raghu Dixit, you all know whom I am talking about, inspite of his belonging from Non-Film music. Yes, everybody knows him because he has established his own independent identity. His famous Raghu Dixit Project gained worldwide popularity. He has recently won his first GIMA (Global Indian Music Awards) for Best Live Performer. After making huge fan following in the Indie world, he is all set to make everyone fell in love with his Bollywood tunes. He debuted as a film composer in a a Kannada film Psycho though his Bollywood debut was with YRF’s minor banner Y Films in Mujhse Fraaandship Karoge, directed by Nupur Asthana, who has again collaborated with Raghu in Bewakoofiyaan, now under the real YRF. (Note: A single of Ayushmann Khurrana, O Heeriye released by YRF some months back, has been included in this soundtrack as a bonus track). 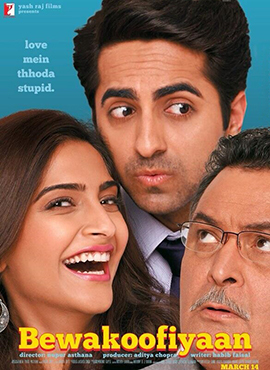 CLICK HERE to buy Full Soundtrack of Bewakoofiyaan from iTUNES!!! It’s a song written with high self esteem. Benny Dayal, who is like a king of club songs these days, though I won’t consider it as a club song, has sung with high energy and great enthusiasm. The pitch of the song is quite high and difficult to sing. But he has managed the whole song perfectly. It has 3 stanzas of same notes. Nagada that has been used in last two stanzas and not in the first one, adds some extra energy to the song. Not the same repetitive words but meaningful lyrics by Anvita. Although Aditi Singh Sharma has been mentioned as the singer, you won’t be able to listen her voice just because Benny’s vocals have fully captured the song. A Benny Dayal show! This must be the most innovative title track ever! Although the starting notes resemble a bit with the line Khushnuma awaara sa, besabar bechara sa lamha tha of the song Lamha Yeh Jaayega Kahaan from Dil Dosti Etc but as it moves forward, it brings the much needed freshness to your ears. The rhythmic drums with steady Guitar strums makes it a nice foot-tapping track. But if you are still getting bored with this unusual sound, Raghu Dixit has a very unique thing for you all. That is, BewakooOOOfiyaan. His extra ooo‘s authenticates and justifies the title of the song and the film. It was truly unexpected but it surely satisfies its listeners. Listen to it for those OOO, a kind of vocal sound that was never heard before. (Note: It’s not a Yodling sound). It was about to be a typical Rom-com song but Raghu Dixit seems to have firmly decided not to include any typicality of any genre or style and therefore has added and modified it too. The brighter Shreya Ghoshal sounded, the duller Mohit Chauhan’s vocals performed. It has catchy tunes that other songs lacked and also sounded as fresh as others. Not any applauding tune but the way the Guitar has been played, is really beautiful. Shreya’s vocals showed their immense brightness in the hook line Rumaani sa, rumaani si and that line is the best part in the song which has capability to get the listeners attracted, and made the song to be played on loop. Mohit Chauhan could have shown more enthusiasm. A track to love, for a limited time period. If it doesn’t suit in this fantastic soundtrack, it will surely look perfect in the film. The only situation-oriented track which offers nice instrumentation with Banjo supporting throughout the song faithfully. Choosing Vishal, if for the situation perspective, I would applaud, but if as for a commercial aspect, then Vishal’s vocals completely failed to yield the interest of the listeners. After listening to the above awesomeness, it would surely bore you after a certain time. Although it failed to do an impressive job in the soundtrack, I have complete faith in it that it will be liked by people while watching the movie. A one time listen track! Ends abruptly, starts abruptly, and above all, it has been included abruptly in the soundtrack. It’s a Single released by YRF last year in September featuring Ayushmann. I hadn’t liked the song that time. So, ofcourse, I don’t like it today also. It’s a Punjabi pop ballad which has some annoying sounds of instruments specially Electric Guitar after the line Yeh Gal Tu Maan Vich Basaa. I liked Ayushmann’s vocals though. It was not a hit at the time when it was released. It wasn’t even noticed properly and that’s why they included it as a film track to popularize it. But they have to accept that the track has nothing in it to get popularity. It’s a below average composition. A disappointing effort after their gorgeous Paani Da Rang and beautiful Saadi Gali Aaja. Bewakoofiyaan has brought back Raghu Dixit to mainstream film music and Raghu Dixit has brought his own sound and introduced it decoratively to Bollywood. Gulcharrey is catchy and lyrically innovative, Anvita Dutt’s one of the best works. I select Khamakha as the best of the album as it has the power to make its listeners croon the tune all the time after listening to just once. Habib Faisal’s lyrics has a big role in that. Title track is highly innovative and its OOO is incredibly attractive and applauding. Rumaani Sa is a typical lovable foot tapping melody with a tinge of Raghu Dixit’s sound. Aye Jigida has to be the weakest track though it has been composed and written well but it is limited to the movie and not a soundtrack-friendly. The additional track, out of nowhere, has been added in the soundtrack just to make it reach to more listeners. But it’s a big let down. All I hope for next time is that Ayushmann and Rochak Kohli compose some fresh sounding melodies and not just the repeating stuffs.